Here we go rougarou/All on a Saturday night. After getting his start working for McFarlane Toys, and then striking out on his own and becoming Diamond Select Toys' go-to guy for pretty much everything, sculptor Jean St.Jean has decided to create his own original line, based on famous cryptids: Creatureplica. The Louisiana Rougarou is an American transplant of the French belief in the loup-garou, or werewolf. The lycanthropic affliction can be imposed by a witch's curse, or in French tradition, as a punishment for Catholics who break the traditions of Lent seven years in a row. Transmission of the curse through bites and scratches is also common. 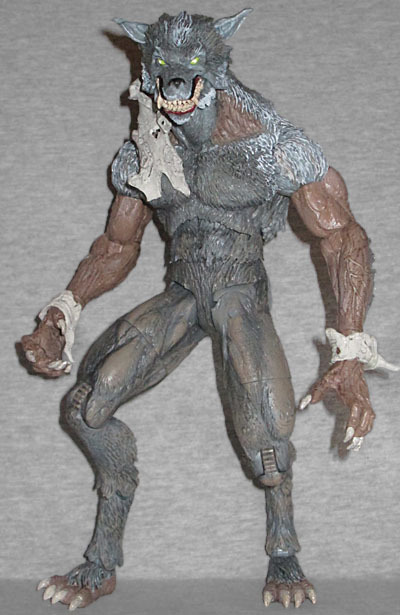 Despite its exotic name, the Louisiana Rougarou is a pretty standard werewolf: muscular humanoid body, animal feet, claws on the hands, etc. The oddest thing about him is the way his fangs flare out slightly, rather than pointing straight up and down. His eyes are yellow, and there are bits of fur above them that are clearly designed to look like big sinister eyebrows. His lips are curled up in a fearsome snarl. The nose should really be out at the tip of the snout, rather than set back a bit - that's usually reserved for brachycephalic dogs. The body is, as you'd expect, sculpted very well. Like there was ever any doubt! RouPaul has thick fur on his shoulders, feet and elbows, plus of course the back of his head. The hair thins out on his chest, and then is all but non-existent on the arms and thighs. 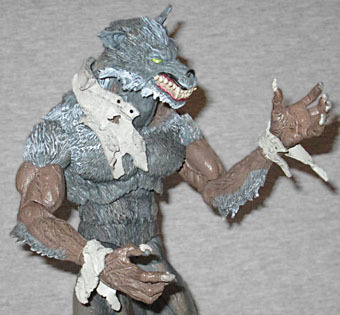 There's really no transition at all between the fur on the shoulder balls and the skin on the upper arms - apparently the Rougarou Nairs all the way up to his armpits. The skin looks great, with veins, tendons, lumps, bumps... the whole shebang. The level of detail in the skin makes the creature look inhumanly distended, which is the idea. 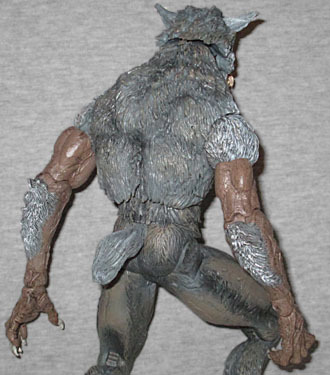 Because he's a man-wolf, he's even got a cute little tail. The figure has a few accessories... or maybe add-on parts. It depends on how you want to consider them. Proving that this was once a man, the Rougarou has three random bits of clothing that cling loosely to him: a small one for each wrist, and a larger strip that drapes over his shoulder; in other words, cuffs and collar. They just rest lightly against the body, not clipping or plugging in place in any way, which means two things: one, they fall off easily; two, they don't leave any obvious flaws on the figure when they're not there. No pegs, no holes, nothing to say that the figure is incomplete. If you like giving him tattered clothes, you can, but if you prefer a bare wolf, you can have that, too. Like we said, Jean St.Jean does a lot of DST's toys, and if there's one thing you can say about Diamond Select figures, it's that they don't skimp on the articulation. 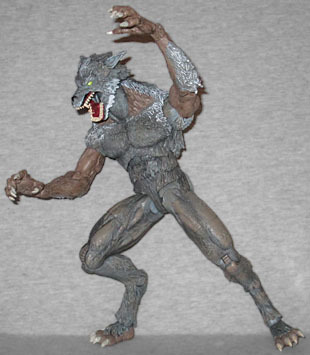 The Louisiana Rougarou has swivel/hinge toes, hinged ankles, hinged knees, swivel thighs, swivel/hinge H-hips, a swivel waist, swivel torso, swivel/hinge wrists, hinged elbows, swivel biceps, swivel/hinge shoulders, balljointed head and neck, hinged jaw, and - get this - swivel ear joints. That's right, you can turn his ears different directions! Balljoints would have been better (that is, more expressive), but a balljointed torso would also have been better than a swivel chest and that didn't happen either. But come on, this is the first line he's done on his own, and this is amazing for a first effort. Even the paint looks terrific! 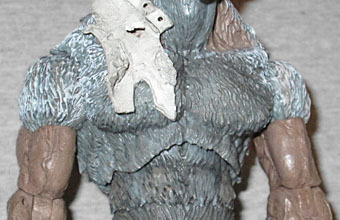 The skin is brown, and the fur is done in at least three different shades of gray. There are photos of a white "Ghost Wolf" variant, but no word yet on where that might be released. 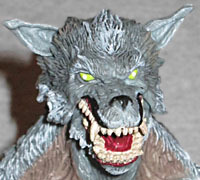 The teeth and claws are a glossy bone color, and the inside of his mouth is a dark red. Muddy brown apps make him look like he's been running around the swamp, and the remains of his clothes are a pale gray with a darker wash and black buttons. Speaking of the swamp, the figure comes with a display base that has three thick pegs. 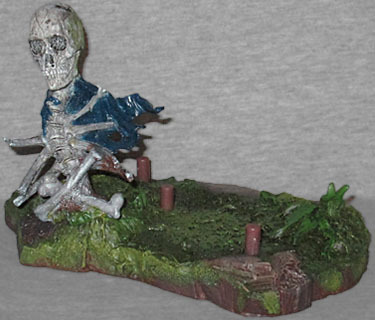 It's just a little chunk of 5¼" x 3½" dirt, but it's sculpted with plants, rocks and moss, and there's a skeletal trophy to mark his territory. It's a skull, spine and ribs with a bit of blue shirt still clinging to it, and there are two bones crossed in front of it. Apparently the totem is facing south, because there's heavy moss growth on its back - that's completely sculpted, not just green paint to save money. Honestly, a little money-saving might not have gone awry. Remember, this is a small personal project, not something made in huge numbers by an established company, so the Creatureplica figures cost about twice as much as similar offerings. The Louisiana Rougarou may be perfect for fighting Van Helsing and Lucy Westenra, but he costs nearly as much as both of them together. That said, the figure feels "expensive," not "like a rip-off": St.Jean packed as much value into the figure as he could, without compromising on the sculpt, paint or articulation. So maybe skip a couple Mattel DC figures, or three Hasbro 4"ers, and get yourself something really cool instead.